Scientists with the International Union of Pure and Applied Chemistry (IUPAC) have officially approved the names of four new elements, completing the seventh row of the periodic table. The four elements, discovered between 2002 and 2010, aren’t new per se, but the names are. 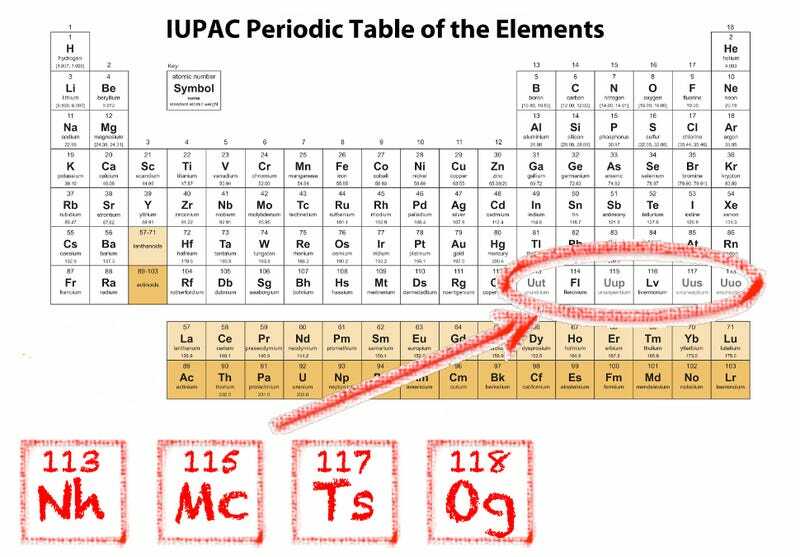 IUPAC officially recognized the discovery of the super-heavy, highly reactive elements in December of 2015, and announced the suggested names back in June of this year. After a five-month chill-out period for the world to digest the new monikers, the bureau made the names official this week. Japanese researchers proposed Nihonium, which means Japan, and a team of scientists from Russia and the US named Moscovium for Moscow and Tennessine for Tennessee. Oganesson was named in honor of Yuri Oganessian, a Russian chemist. The additions replace the current seventh row placeholders, ununtrium, ununpentium, ununseptium, ununoctium (and good riddance). Nihonium is an extremely radioactive element that’s created in the lab and not found in nature. It was first synthesized in 2004 by Japanese scientists who combined zinc ions with the element bismuth. At present, it’s only used in research. Mocovium, synthesized in 2003, is also radioactive, featuring a blazingly fast half-life of only 220 milliseconds. Tennessine is a superheavy artificial chemical element, of which only a few atoms have ever been made. Oganesson has the highest atomic number and highest atomic mass of all known elements, and it’s extremely unstable (scientists aren’t even sure if it’s a gas or solid under laboratory conditions). In fact, all of these elements are highly unstable, making them impractical for much use beyond scientific inquiry. During the five month review, the public was given the opportunity to pitch their own names, the most notable being “lemmium,” after the late-Motorhead frontman Lemmy Kilmister (cuz it’s a heavy metal). Other proposed names that were rejected included “octarine” (in honor of the late Terry Pratchett and his Discworld series of books), “Godzillium” and “trumpium,” which, why? You can learn more about these elements at the IUPAC website.